With Anand, Aronian and Nakamura on 6.5 points, Hungarian Peter Leko joined Karjakin in fifth spot a full point behind while P Harikrishna slipped to joint seventh on five points, after suffering a shock defeat at the hands of Yifan Hou of China. World champion Viswanathan Anand could not breach the solid defenses of Sergey Karjakin of Russia and played out a draw while world number one Magnus Carlsen continued with his winning streak in the 75th Tata Steel chess tournament here. In the tenth round, the Indian ace's efforts proved little to break Karjakin's solid defense right till the end of a rather simplified game. Anand was joined in second spot by Levon Aronian of Armenia and Hikaru Nakamura of United States after they scored victories in contrasting fashion against Wang Hao of China and Fabiano Caruana of Italy respectively. Meanwhile, Carlsen stretched his lead to eight points as Erwin L'Ami of Holland proved no match for the rampaging Norwegian. The Queen's Indian defense by Karjakin met with the Petrosian system and Anand secured a small advantage in terms of better space control. However, Karjakin was precise in his defense even though it looked at some point that Anand was increasing his advantage. Once Karjakin was able to get rid of his weak pawn on the queen side the draw was immediately agreed. Harikrishna ran out of steam against Yifan Hou. Having done so well in the tournament against high class opposition the loss against Yifan was simply shocking. For the records, Harikrishna stood better after a Keres attack as white against the Sicilian but Yifan fought back in the game after trading the queens. Harikrishna made another error and Yifan pounced on it to reach an advantageous rook and pawns endgame where precise technique followed to give the Chinese her second victory in the tournament. Carlsen crushed L'Ami in a Caro Kann defense game as white. The Norwegian secured a good position out of opening and then took advantage of weakened pawns on the queen side to force matters. In other important games of the day, Aronian had it easy as white against Wang Hao out of an English opening while Nakamura got an important victory with black pieces after Caruana went haywire. The tournament now reaches its final leg with just three rounds to come after a rest day. 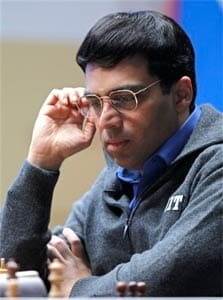 Anand has a chance to catch up if he beats the tail-enders he is set to meet. V Anand (Ind, 6.5) drew with Sergey Karjakin (Rus, 5.5); P Harikrishna (Ind, 5) lost to Yifan Hou (Chn, 3.5); Levon Aronian (Arm, 6.5) beat Wang Hao (Chn, 4); Magnus Carlsen (Nor, 8) beat Erwin L'Ami (Ned, 3); Fabiano Caruana (Ita, 4.5) lost to Hikaru Nakamura (Usa, 6.5); Loek Van Wely (Ned, 5) drew with Anish Giri (Ned, 4); Ivan Sokolov (Ned, 2) lost to Peter Leko (Hun, 5.5). 1. d4 Nf6 2. c4 e6 3. Nf3 b6 4. a3 Bb7 5. Nc3 d5 6. Bg5 Be7 7. Qa4+Qd7 8. Qc2 dxc4 9. e3 Nd5 10. Ne5 Qd8 11. Bxe7 Qxe7 12. Bxc4 Nxc3 13. Qxc3 O-O 14. O-O Nd7 15. Nxd7 Qxd7 16. Rfd1 Rfd8 17. Be2 a5 18. f3 Qe7 19. Rac1 Rac8 20. Qb3 Rd6 21. Rc3 Rc6 22. Bc4 h6 23. Rdc1 Rd8 24. Qc2 Kh8 25. Qf2 Kg8 26. Qg3 Kf8 27. h3 Qd6 28. Qh4 Qe7 29. Qg3 Qd6 30. Qf2 Kg8 31. Qh4 Kf8 32. b4 axb4 33. axb4 Qd7 34. b5 Rd6 35. Bf1 Rc8 36. Qf2 Qe7 37. Qa2 Rd7 38. Qa7 Ba8 39. Qa6 Rdd8 40. Kh1 g6 41. Qa7 Rd7 42. Qa1 Kg8 43. Ra3 Bb7 44. Ra7 c6 45. Rc3 Qd8 46. bxc6 draw agreed.